Come dine with us during our extended hours of Masters Week. 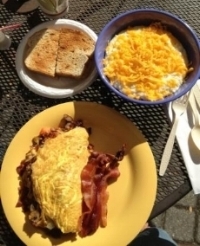 We will start breakfast at 6:30 am, and serve dinner Monday through Saturday from 5 pm. See below for three meals a day at What's Cookin' Downtown. Have guests coming to your place? Our coolers are full of to-go and deli items in The Shop. Worried you might get hungry too far away from a snack at the Augusta National? Grab one of our Sack Lunches -- it comes with a fresh-made, pre-packed sandwich and your choice of two: chips a granola bar, or a piece of fruit. Might as well get a soda while you are in the cooler. We kindly request that you call ahead for special casserole orders or food for a crowd. Check out our choices in Catering. Start your day with some Gourmet Grits and top them with whatever strikes your fancy: maybe crumbled bacon, cheese, and vine ripe tomatoes? Grits not your thing? Maybe try our Biscuits or Stuffed French Toast or an Egg Sandwich or maybe Eggs in a Basket or a Fresh Fruit Bowl or.... Check out our full menu in The Restaurant tab above. Breakfast will be served from 6:30 until 10:30 am Monday through Friday, and until 11 am on Saturday. We also feature coffee roasted right across the street by our neighbors at Moon Beans. Get your burger just how you want it, in a basket with a side of your choice. Grilled sandwiches. Cold beer. Crispy salads. Burgers, Hot dogs. If you are really hungry, our Chicken Fried Steak Sandwich or Club Sandwich Plate might do the trick. Want something a little lighter? Our fresh Chicken Salad with Grapes and Nuts is wonderful in a sandwich or on our Salad Plate. Check out our full menu in The Restaurant tab above. Lunch will be served from 10:30 am until 4 pm Monday through Saturday. Check out our Facebook page for daily lunch specials and to meet some of our regular customers. Lobster Ravioli with house-made Alfredo and a glass of wine? A hole in one! Ready for a "fine dining" dinner in a relaxed atmosphere? That's What's Cookin'. Nightly dinner specials will include a grass-fed New York Strip, Lobster Ravioli, and Chicken Béarnaise. Dinners come with our Dinner Salad and a side. Our regular dinner menu will include our Burger Plate, Chicken Fried Steak Sandwich, our classic Reuben Sandwich, and a Chicken Cobb Salad. For a full description of dinner specials as well as our beer and wine list, click on the tab above for our blog, Food For Thought.